The Digital Transformation is upon us. Enabled by mobility, it is one of the most disrupted waves of technology evolution since the computer was invented. It has changed the world's relationships with technology. The Physical world and the digital world now blend into one. In this newsletter, we share our thoughts on the mobility-led opportunities that have emerged and look at the issues that have to be addressed if we are to adapt successfully to the new world order. We have to embrace the change to drive the business outcomes needed in today's rapidly evolving marketplace. Innovation is only limited by the extent of our imagination. 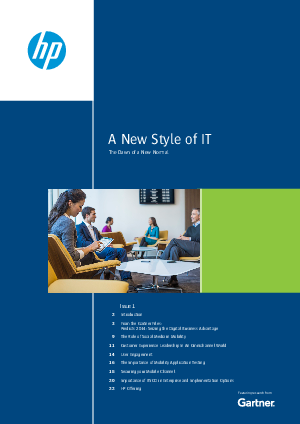 In the following pages we aim to share some important aspects of this New Style of IT.